Government forces and coalition helicopters have finally put an end to insurgents’ 18-hour attacks in Afghanistan. The Taliban-claimed raid on Kabul’s diplomatic area and three eastern cities was the most serious since the Taliban was ousted in 2001. Afghan Interior Minister Besmillah Mohammadi told reporters on Monday that a total of 36 insurgents were killed. Three civilians also lost their lives, and 32 others were wounded. 11 officers were killed and 42 wounded among the Afghan security forces. One of the insurgents arrested by police said that the Al-Qaeda-linked Haqqani network, based in Pakistan, was behind the attacks. The assault on the parliament, foreign embassies, airport and residences was overcome by heavy gunfire from Afghan-led forces and pre-dawn air assaults from US-led coalition helicopters. Fighting raged near the parliament throughout the night and early Monday morning. Witnesses said rocket-propelled grenades and gunfire rocked the area. An Afghan Interior Ministry spokesman said some lawmakers grabbed weapons and started fighting back the militants sheltering in nearby buildings. The NATO headquarters, British, German and Japanese embassies, as well as the residence of the British ambassador were also under attack. Explosions caused minor damage to the German and British embassies, but no staff were injured. 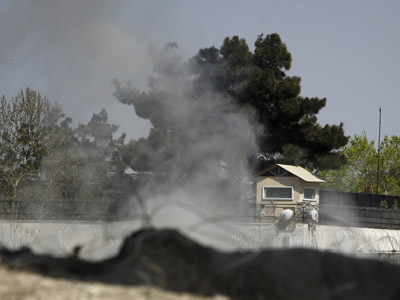 Outside the capital, militants attacked government buildings in Logar province, the airport in Jalalabad, and a police facility in the town of Gardez in Paktya province, where a NATO helicopter was reportedly deployed against them. Three militants were arrested on allegations of plotting to kill President Karzai's deputy, Mohammad Karim Khalili. 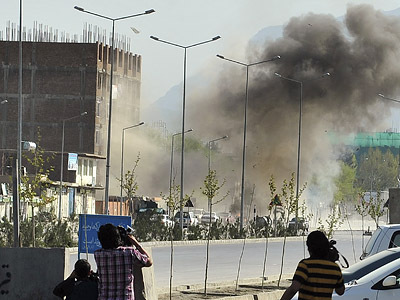 The Taliban claimed responsibility for the assault shortly after it started on Sunday. Taliban spokesman Zabiullah Mujahid said dozens of suicide attackers and gunmen were involved in the raids that had been planned for two months. 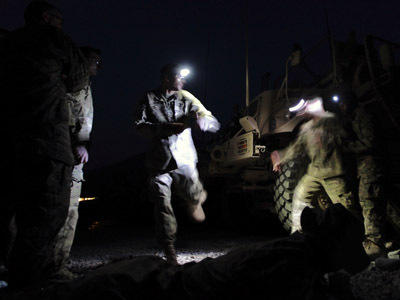 The aim was to show the insurgents’ power after NATO called the Taliban weak, saying there was no indication the militants were planning a spring offensive. ``We are strong and we can attack anywhere we want,''Mujahid said. 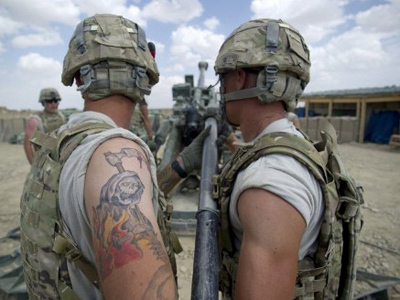 The Taliban said the attacks came in retaliation for recent incidents when US marines burned the Koran, were shown urinating on dead Afghans and for the Kandahar massacre, when 17 Afghan civilians were killed by a US soldier. The American Ambassador said the violence showed why the US should not try to hasten the exit from Afghanistan. 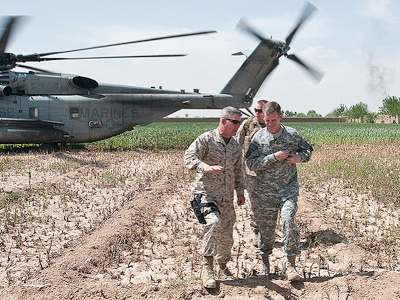 The majority of international combat troops are scheduled to leave by the end of 2014.